How Does Dry Cleaning Really Work? We all want to look our best, and we know that keeping our clothes at their best is a big part of that. If you're considering getting your clothes dry cleaned, it's important to know what you're spending your money on. There are many benefits of getting your clothes dry cleaned by a professional. A dry cleaner will put care and expertise into taking care of your garments. Dry cleaning is a process very similar to washing. The most common solvent on our planet is water. A solvent is any substance that is able to dissolve other substances. In this case, dry cleaners use a solvent that disolves dirt, food, oils, and more, that doesn't contain any water since water can damage fabrics such as silk and wool. Each dry cleaning service has a process of identifying your clothes and keeping them organized. Whether it's small paper tags or labeled hangers, the process is usually similar. Clothes are organized and notes are made about any special requests you may have. Notes are made about existing damage such as tears or missing buttons. Regardless of your individual dry cleaner's process, you can rest assured that your garments go through a rigorous and highly automated process of tracking and organization. If your garment needs special care (removing specific stains from a shirt or putting a double-crease in pant legs) be sure to tell your dry cleaning specialist. This allows them to make the appropriate notes and attach any necessary tags. Once your clothing's cleaning process is complete, it goes through a rigorous quality check. Your garments will be bundled together according to their tags for you to pick up. Before the dry cleaning begins, your dry cleaner will look for areas that need specific attention such as stains or spots. Collars and cuffs often need particular care. The entire garment is treated and cleaned. However, inspecting it and applying specific soaps can help with spots and stains. If you're not sure what to do for your stained garments, you can help your dry cleaner. You can blot both sides of the stained fabric so that the stain can "bleed off" onto the blotting cloth. Let dry and leave the rest to your dry cleaner. Now, to the machines themselves. Dry cleaning machines are motor-driven washers, extractors, and dryers all in one. They hold from 20 to 100 pounds of clothing. Most machines contain a rotating, perforated stainless steel basket. In all modern machines, the washer and dryer are in the same machine. A dry cleaning machine is able to remove all of the cleaning solvent in a way that your regular washing machine cannot. As the clothes rotate in the perforated basket, there is a constant flow of clean solvent from the pump and filter system. The next cycle drains and rapidly spins the clothes to expel the solvent and then goes into a dry cycle by circulating warm air through the clothes. 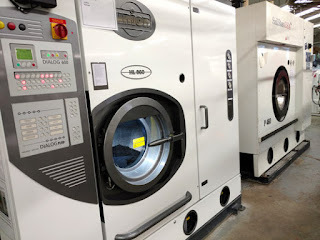 Regardless of which solvent or machine your dry cleaner uses, the result ultimately depends upon the degree to which they control their filter, solvent condition, and moisture. For this reason, it's important to work with a true professional whom you trust. Post-spotting uses professional equipment and experience. This includes using steam, water, air, and vacuuming processes. If the stain contained water to begin with (a wet stain), then it takes water or wet-side spotting agents to remove it. However, if the stain was on the dry side (like grease or nail polish), it takes solvents or dry-side spotting agents to remove it. The dry cleaner will examine your clothes after they're cleaned to see if any stains remain. Then, they will take the appropriate steps to further remove it. A conscientious cleaner will remove the overwhelming majority of soil and stains, but there is always a small percent of very stubborn stains that may not be entirely removed. These reasons can include tannin stains set by heat and time, original dyes, bleaches or sun-faded materials, or foreign dye deposits. This includes pressing, folding, packaging and other finishing touches. The final phase of dry-cleaning operations includes finishing, pressing, steaming, ironing, and making any necessary repairs to restore the garment. This is the least mysterious process since most dry-cleaning stores have their professional finishing equipment in plain view of customers. Once the clothes are cleaned, they are pressed or "finished." This means that steam is applied to soften the garment, the garment is re-shaped through quick drying, steam is removed by air or vacuum, and pressure is applied to the garment. The pressure comes from the head of the pressing machine, while steam is diffused through the bottom. Most machines not only emit steam but can vacuum it out as well. Now that you know how the dry cleaning process works, you know that your stubborn stains and other specific clothing care can be entrusted to your dry cleaner. There are so many stains and issues that people try to take care of at home in their standard washing machines that should, in fact, be taken to a dry cleaner. It's important to know which clothes should be taken to a dry cleaner. Dry cleaners are also experts at taking excellent care of your most delicate and precious pieces. Whether you're getting it ready to wear on your big day or getting your wedding dress ready for display, a dry cleaner is the best way to take care of your most valuable garments. Are you looking for the best dry cleaner near you? We treat your garments as if they were our own. Located in Berkley and Bloomfield, we at Janet Davis Dry Cleaners offer complimentary pick up and delivery service. 248-543-0340.